FEMA recommends cleaning your dryer vents at least once per year. But you may have to do it more often based on your family's needs. History is full of notable duos; Lewis and Clark, Sonny and Cher, and Batman and Robin. But only one pair makes a difference in our lives almost daily: The Washing Machine and the Dryer. We’ve gone over a simple way that you can take care of your washing machine to prevent water damage, and now the dryer should share the spotlight too. After all, it does so much for us besides just dying clothes. Wrinkly shirt pants the morning of a job interview and you don’t have time to iron, or you just want a warm and comfy to snuggle under while you binge watch a certain show that talks about Winter all the time. The Dryer is there for you, be there for it. One of the easiest ways that you can take care of your dryer is to clean the lint screen after every load. This ensures that your dryer is working efficiently and safely. If you use dryer sheets, you may have to do more than just a quick wipe down of the filter. Experts have said that the sheets can cause a slight build up over time that is not easily removed, and you can test your lint filter by pouring a small amount of water over it, and if the water pools anywhere you can gently clean the screen with a brush in warm, soapy water. Just be sure to thoroughly dry it before the next use. But dyer filters are not the only part that you need to clean, those screens filter lint and other material, but it does go somewhere and exits out of the dryer vents. And those do need to be cleaned on occasion; the frequency depends on the load sizes and how much you use the dryer. Start with the exit vent, as these can be inviting to animals of all kinds. Lower vents can attract small rodents, and higher vents can make nifty places for birds’ nest. Once the exit is clear you can focus on the link inside of the vent pathway. There are a few ways that you can do this. You can use an air compressor to blow it out, but that can be messy. There are vacuums that have brush attachments but are limited by the length of the hose on the vacuum. You can purchase flexible brushes with extendible wands; these can work at both ends of the vent. There are even professionals that can provide this service just search “Dryer vent cleaning near me” to find one for you. Keeping a clean dryer vent will help to improve the efficiency and lifespan of your dryer, but the ultimate reason is for safety. 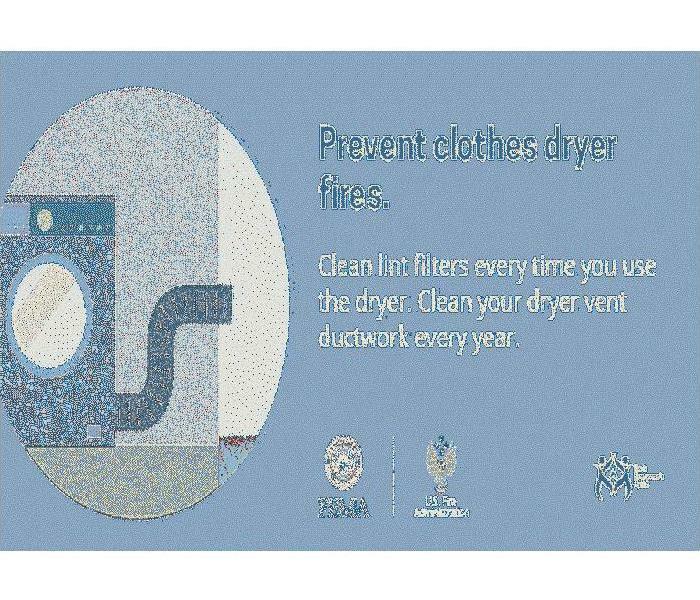 Lint can build up in the vents, and according to the National Fire Protection Agency, more than 15,000 dryer fire happened in the US during 2010 with clogged filters being the leading cause. Our franchise has had to perform our fire and smoke restoration services to homes affected by fires that started because of a dryer. And several years ago, I lived in an apartment community when the laundry facility caught fire because several of the dryer vents were clogged. So dryer fires are a serious issue. Making the investment in cleaning or having your dryer vents cleaned is one way that you can take care of your dryer and keep your family and property safe. 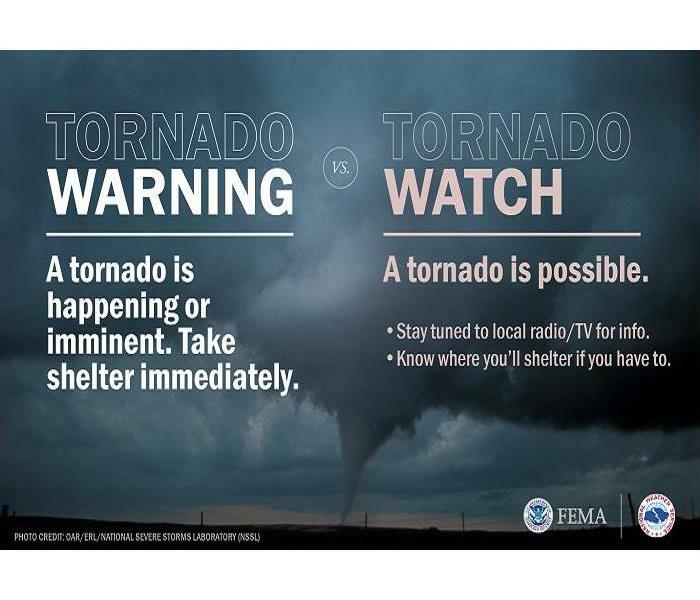 The differences between a watch and a warning are drastic when dealing with tornadoes. Make sure your family understands them. I was eights years old when Hurricane Hugo tore through the Upstate of South Carolina. It was one of the scariest days of my life. My mother and I lived in a trailer at the time, and I could hear the wind rattle the walls over the sound of the rain pounding the metal roof. The power was out, and we were listening to a battery-powered radio, as it repeated the various warnings and watches across the area. The announcement came over about a severe storm warning and a tornado watch for the area we lived in. My mom said we would be fine. Less than 30 mins later we were now under a tornado warning. We began scrambling to gather our pets and get in the car to drive to our neighbors’ house, but we were too late. A roaring train sound came through, and everything began to shake. My mom grabbed me, and we ran into the bathroom and jumped in the tub. When suddenly we were flipped. Our trailer had been flipped over, and it could have been much worse if not for the pins that did hold. But it was over quickly and those few moments are a blur. Our home was all but destroyed after whatever hit us passed, my left arm was broken, my mother had a few broken ribs and a bad cut, and our pets didn’t survive. I did not share this story for sympathy, instead to help show the importance of understanding what a watch or a warning means when it comes to severe weather. Had we taken action when the watch was issued, things may have happened differently. Tornado Watch: Tornadoes are possible in and near the watch area. A watch area may be vast, spanning several counties and sometimes states. If a watch is issued in your area, start to prepare for severe weather. Check to make sure that there are supplies and that the designated safe area is ready, as well as confirm that everyone understands the plan. Tornado Warning: A tornado has been spotted or indicated by radar inside the designated warning area. Warning areas are smaller and have shorter time intervals than watches. If a warning is issued for your area, take action and seek shelter immediately. Keep updated with weather alerts to be certain when the warning has expired. Please learn from my experience and make sure that your family or coworkers understand the difference between a watch and warning, and make sure to have a plan in place. No matter if you choose to go with a simple or elaborate firepit, make sure to make your design with safety in mind. Spring evenings are my favorite time to utilize the fire pit in the back yard. The night air is still a little crisp, and the bugs are not in full terrorize mode. Lighting the fire, pouring a drink, and putting on some ‘90s rock music are the keys to my paradise. And I hope that you enjoy relaxing by your fire pit as much as I do. Oh, you don’t have a fire pit, but I bet you want one now. If I have managed to spark any interest in setting up a fire pit, be sure to check out the following safety “Do’s and Don’ts” from Nationwide Insurance. 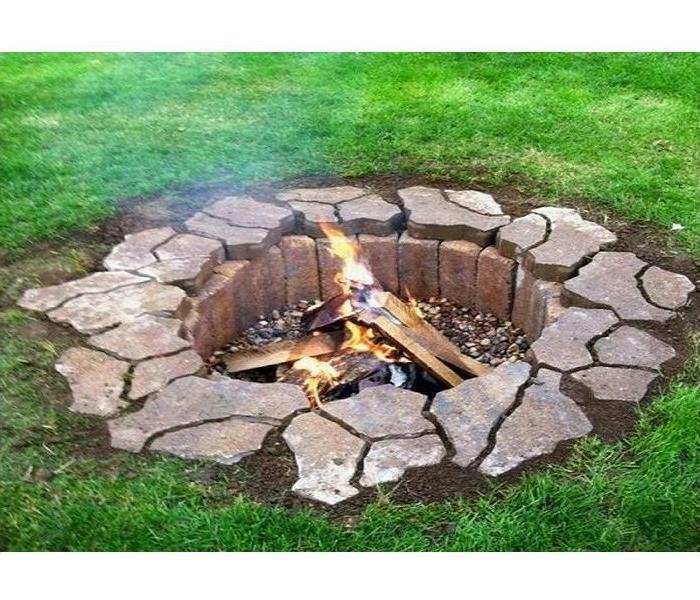 Make sure the ground or surface is even to reduce the risk of fire escaping beyond your fire pit. The level ground also reduces the risk of someone stumbling or items rolling into the fire. To keep your fire from causing damage, build the fire pit at least 10 feet from your home, fences, trees and the like. Portable fire pits are great but do not be tempted to relocate it inside a garage or covered porch if it happens to rain. Smooth stones from river beds may have absorbed moisture over time and can heat rapidly and explode. Instead of river stones, build your fire pit with dry, rough rocks. Following these best practices will help you to keep your sanctuary a safe and relaxing place. Now if you would excuse me, I am off to cut some firewood and purchase a few bags of sand. Replacing the water supply line hoses to your washing machine is a way that you can reduce the risk of them leaking or worse, bursting. Of all the chores around the house, laundry seems to be the most daunting task. It never seems to end, and I am only responsible for my laundry, I cannot fathom what those with families go through. But no matter your family size, your washing machine is one of the hardest working appliances in your home and needs some TLC now and then. Your car requires maintenance; change the oil, rotate the tires, flush the radiator. Shouldn’t the appliance that makes sure your clothes are clean deserve the same? A simple way that you can maintain your washing machine is not to overload it with items to clean or detergent. Suds and bubbles flowing out of a washing machine make for fantastic ’80s and ‘90s sitcom laughs, but they can cause significant issues. On top of the apparent water damage, laundry detergent can stain or bleach flooring and can lead to delamination. Putting too many items in a washing machine is another potential disaster waiting to happen. The barrel may become unbalanced and force the machine to rock and potentially jar the water supply connections lose. Preventative action can go a long way to maintain the life of an appliance. 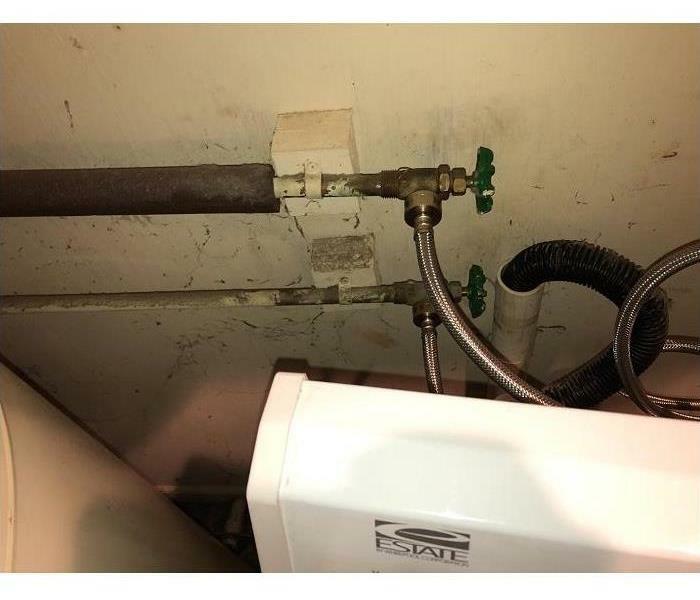 One of the best ways that you can show your washing machine some love is to change the water supply line hoses around every five years. Over time these hoses can become weak or brittle, and risk cracking or bursting. And can create a tiny leak that can cause long term water damage, or a burst hose can rapidly unleash gallons upon gallons of water flooding multiple rooms and creating significant water damage. Neither of these options sounds very pleasant, and while replacing the supply line hoses will not 100% prevent either one, it does lower the risk substantially. There is no “best” type of hose to pick as the replacement, as each manufacturer and model of washing machine are very different. That is why it is best to consult your washer’s owner’s manual before you make any decisions. You can also check out the manufacturer’s website to view any certified service suppliers to perform the hose exchange for you. Take care of your washing machine just like you would a vehicle, and just like a vehicle, it will take care of you for a long time. If your washing machine or any other appliance in your home has a malfunction and causes water, fire, or smoke damage contact our SERVPRO of East Greenville Team. Testing a smoke alarm once a month will help to determine when the batteries need to be replaced. Daylight Saving Time began a few weeks ago, and hopefully, you and your family have adjusted by now. Everyone is feeling as rested as they can, eating at the “right” time, and felling “normal.” But do you have a nagging sensation that you have forgotten something? 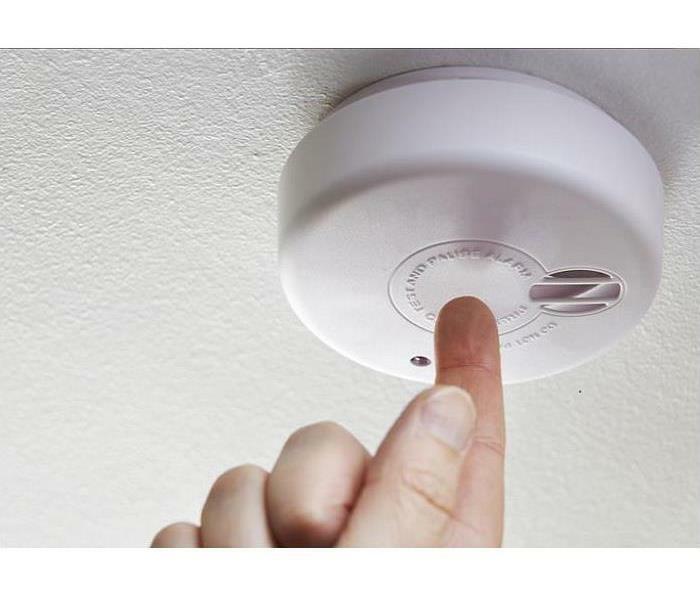 Have you changed the batteries in your smoke detector since the time change? Since the last time change? In the past 365 days? When was the last time you changed the batteries or at least checked them? There once was the idea that you should change out the batteries in your smoke detector every six months, and you used the changing of the clocks as a reminder. But batteries have changed, and smoke detector technology has also changed. So, are every six months guidelines even applicable anymore? That depends on who you ask. In 2015 Consumer Reports answered a reader’s question about how often they should replace their smoke alarm’s batteries, and the answer was a little vague: “It’s true that a lithium 9-volt battery will probably last longer than an alkaline 9V (which in turn should last longer than a carbon-zinc 9V). But how much longer depends on a smoke alarm’s power drain.” But they also stated that the conservative six-month time frame was out of caution and safety and that is why it still a good idea, and if the old battery still has power use it for something that is not related to safety. That is good advice; you are still changing out the batteries but saving cost elsewhere. But you may want something a little more concrete for an answer. On the other hand, the National Fire Protection Association (NFPA) have a few different recommendations and best practices to maintain the smoke detectors in your home. They recommend replacing the batteries in smoke alarms with removable batteries at least once a year, and smoke detectors with non-removable ten-year batteries are completely replaced after ten years. Testing the alarms once a month is recommended to ensure that they are working correctly, no matter what type of smoke alarm you have. And if you hear a smoke alarm chirping that indicates a low battery and it needs to be replaced (not just removed, so the chirping stops). So the “every six months” rule may be antiquated because of changes in technology, but safety doesn’t change. Testing the batteries once a month and replacing them once a year can help to ensure your family’s safety and peace of mind. Besides, you can still use the beginning or end of Daylight Saving Time to schedule the replacement. A downspout is a great way to prevent rainwater from saturating the ground next to your property. If you are like me, the sound of pouring rain is very relaxing, almost nap-inducing. But have you ever heard it sound like that you are in the middle of a monsoon and look out the window to see that it is only a light drizzle? Your gutters may be overflowing causing water to pool against your foundation. Now if this sounds familiar, we do have a previous blog touting how important it is to take the time to care for your gutter. 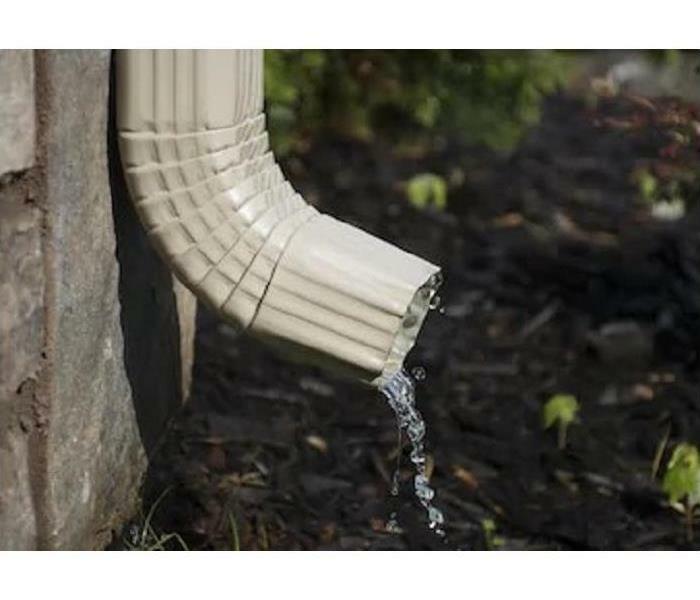 Now, this blog is dedicated to the Downspout, one of the true heroes of preventing water damage in your basement or crawlspace. Modern downspouts not only prevent erosion, but they also prevent water from depositing against a structure and potentially entering via wicking, cracks, and other entryways like crawlspace doors. A finished basement can flood, damaging the floors, walls, and furniture. Standing water in crawlspace can elevate moisture levels, increasing the chance for microbial growth and negatively affecting the air quality inside your home. That is why it is important to make sure that your gutters are free of debris, and why you should put a significant amount of thought into how you design your flowerbeds that are close to your home. Checking the gutters after a severe storm can help catch debris from clogging a gutter or downspout, and that can prevent rain from overflowing from the gutters and depositing near your foundation. You might inadvertently create a dam out of mulch, forcing the water to pool too close to your home and cause the issue that you are trying to prevent. You can also purchase attachments that will extend the pour point and give you more control of where the water flows out of the downspout. There are multiple ways that you can protect your home or property’s crawlspace, foundation, and basement. And having a well placed and maintained downspout is a fantastic addition to your arsenal. The Bathroom Exhaust Fan. Your New Best Friend. The primary purpose of the bathroom exhaust fan has been lost over time. It is actually there to control the moisture levels in the bathroom. Homeownership can be exhausting. So many things beak or need updating, regular maintenance, and the bills. Sometimes it can be hard to tell if you own your home or if your home owns you. And it can be very easy to think a small repair can be put off and ignored, that is until it turns into a huge unavoidable issue. Let’s take a look at one such item; the bathroom exhaust fan. The bathroom exhaust fan is the best friend you never knew you had, and you will miss him when he is gone. But it is only a small problem, right? Yes, it does help control odors in the bathroom, and when you spray all of those cleaning solutions in the sink and tub, it helps to pull those odors out too. You can buy candles and air fresheners, and open the nearest window while you are cleaning, that is cheaper and more convenient than paying to have it repaired or replaced. 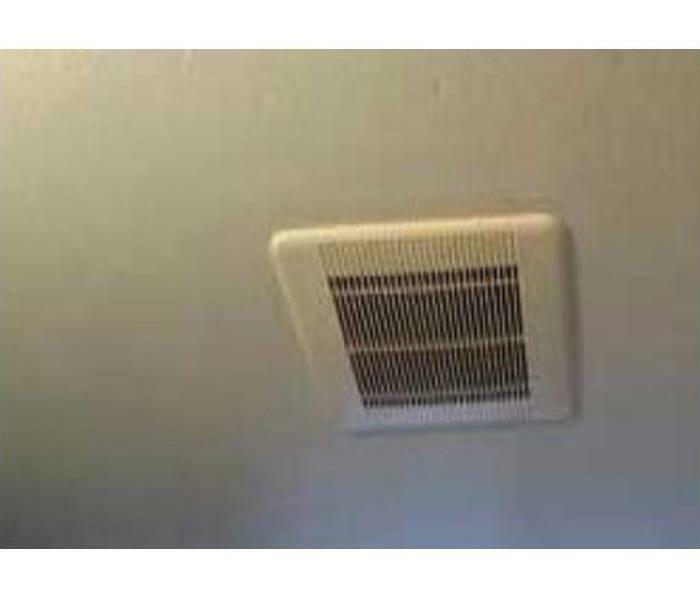 But what about the real purpose for the bathroom exhaust fan, the one that can help save you thousands in repair cost? I bet you are listening now. Odor control is the most noticeable function of the exhaust fan, but it is moisture control that is the real benefit that it provides. Those long, hot showers after a long day that fog up the mirror, well they also “fog” up the walls and doors. The fan helps to quickly adjust the moisture levels in the bathroom, making the bathroom a less ideal environment for mold to develop. Some wooden doors and flooring types may also be prone to warping if they absorb too much moisture, the fan works to keep those intact too. A warped door can be a pain, but if the floor warps in the wrong spot, it can lead to the toilet leaking and even more water damage throughout the house. So, although it may seem like an insignificant item that is easy to keep at the bottom of the “to-do” list, you should give the bathroom exhaust fan a little MVP treatment every once in a while. Dust it when you clean the bathroom, and if it breaks, get it fixed ASAP. After all, it is working in the background to save you money, just like a good friend. The SCEMD app is a great tool that allows users to create plans and stay up to date on weather alerts. March 10th through the 16th is Severe Weather and Flood Preparedness Week in South Carolina. The week is designed to reinforce that severe storms, tornadoes, and floods can have a significant impact on our state, and as residents, we need to take the proper safety precautions. The National Weather Service and the South Carolina Emergency Management Division (SCEMD) co-sponsor the week to promote awareness of the procedures that can help keep you safe during severe weather. Meteorologists can track weather patterns to predict severe thunderstorms and flooding, but tornadoes are much more difficult to anticipate, and warnings may only be issued within minutes before striking. That is why it is essential to develop and practice an Emergency Action Plan at home and work in order to be as prepared as possible in the event of a tornado. Participating in tornado drills will help ensure that your family and co-workers are on the same page and know what action to take as well as their roles afterward. On Wednesday, March 13th at 9 AM there will be a statewide tornado drill, along with broadcast stations testing their emergency alert systems. Listen to NOAA Weather Radio or commercial radio or television newscasts for the latest information. from corners, windows, doors, and outside walls. aware of potential flooding and flying debris. 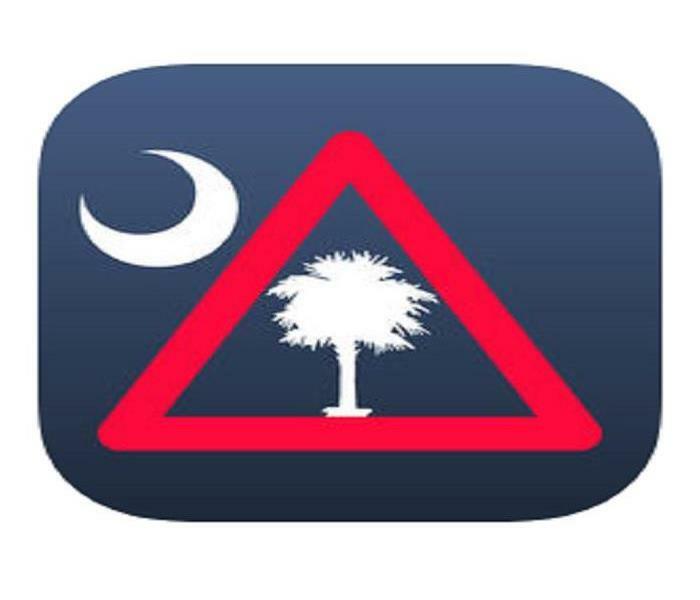 The SCDME also has an application to help you prepare and keep up to date during severe weather conditions. It is available for iPhone and Android operating systems. Fire can quickly spread from a chimney to the rest of a structure. Preventative maintenance can significantly reduce the risk of a fire. In the ten years that I have lived in my home, I have used the fireplace only a handful of times, and all but two of them were when the power went out during a winter storm. I am sure that many of our readers get a lot of usage out of their fireplaces, even when it isn’t that cold outside, but how many of you regularly have your chimney professionally cleaned? Thoroughly cleaning your chimney can provide you with a few benefits, including the safety and health of your family. 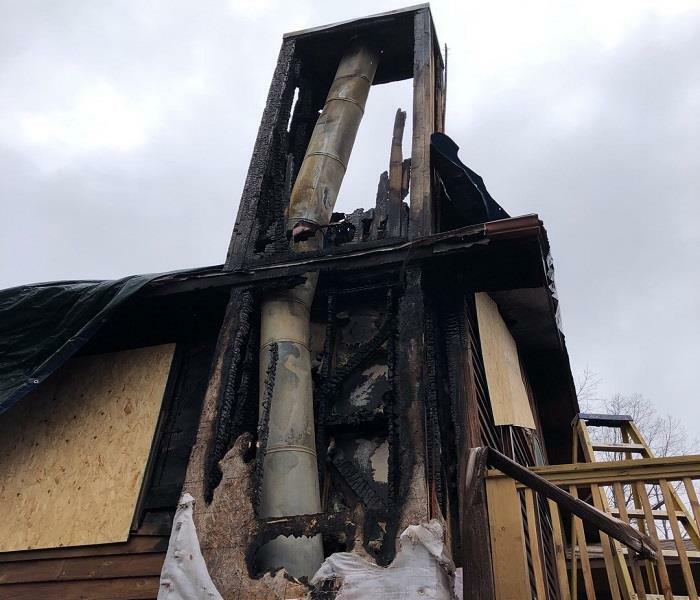 A chimney's purpose is to provide ventilation from the gases or smoke that generate from a device used to heat materials such as a stove, boiler, or fireplace. And over time and with each use a substance called creosote can build up on the inside walls of a chimney. In addition to being flammable, creosote reduces the airflow of a chimney, and that can prevent toxins and smoke from properly clearing from your home. As I mentioned, creosote is flammable. And a flammable substance that can be that close to a source of heat could lead to disaster. A burning ember from the fireplace can float up to a deposit of creosote and cause it to ignite, and the fire can quickly spread through the chimney and affect your home. A regularly maintained chimney can help to limit your family’s exposure to harmful gasses and help to prevent fires. The buildup of creosote is not the only reason to have your chimney cleaned. Animals such as birds and rodents can nest in chimneys and being with them other flammable materials or block the pathway of toxins and smoke. So if you are like me and rarely use your fireplace, you may still need to consider a professional cleaner inspect it just in case you decide, (or have to) use your fireplace. Clean chimneys have other benefits such as more efficient heating and lower power bills during the colder months. But the increased safety is well worth the time and cost to find a professional chimney sweep and start a cleaning routine. Cleaning chimneys may not be one of the services that SERVPRO of East Greenville County provides, but if you are having trouble finding a service provider, we will be glad to help you out. Hanging insulation can be both a symptom of one problem or the beginning of another. And it is best to act if you spot it quickly. While at first glance you would think the big issue is the wet subfloor. (And you’d be right) But, it is the thing that may not stand out to you that can lead to the next giant issue. Although it is only in the top left corner of this photograph, the hanging insulation is the real star. Yes, the subfloor is soaking wet, and if you were to spot this underneath your home, you would be swift to take action. 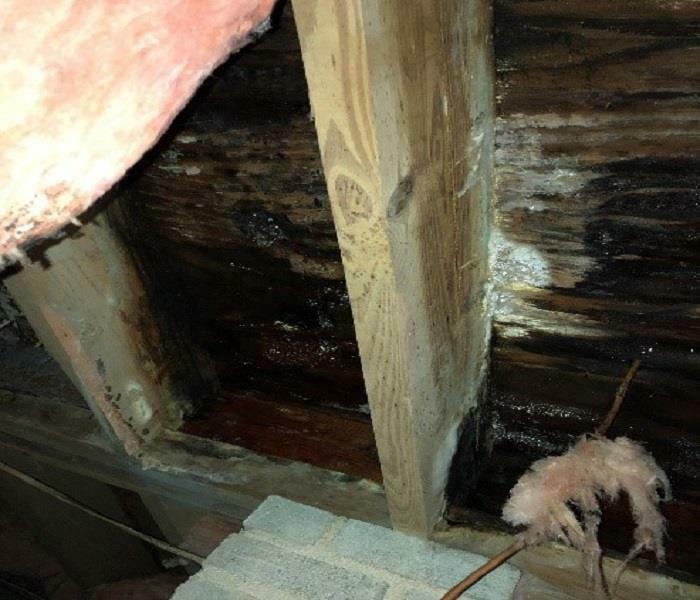 But if you see insulation hanging in some spots of the crawlspace, you may not give it a second glance. Hanging insulation could be a symptom of water damage, but it has the potential to cause microbial growth under your home without you ever having any water damage. If the hanging insulation reaches the ground, it can wick up natural groundwater from rain, and over time that can saturate that piece of insulation and possibly spread to other materials that it touches. Unconditioned crawlspaces can be ideal locations for mold to grow, they are dark, probably humid, and most people never go into the crawlspace unless they have to. The moral of this story is that if you or a service provider see hanging insulation, it may be best to contact a professional like SERVPRO of East Greenville County to inspect your property and prevent issues before they start. 3/11/2019 - The Bathroom Exhaust Fan. Your New Best Friend.